Frank toured with Sonny and Cher, Bobbie Vinton, Tom Jones, Mack Davis, Tony Orlando, and Bob Hope. He is a studio musician and can be heard on various commercials, recordings and videos. Frank is available as a classical soloist for weddings, parties and restaurants. A jazz quartet or trio is also available. 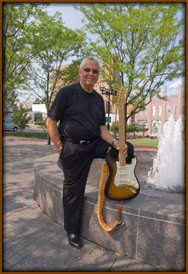 As the Director of The Pennsylvania Guitar Quintet (5 guitars), Frank is available for mini concerts as well as full performances with the quintet. Please visit PAGQ.com for more information.